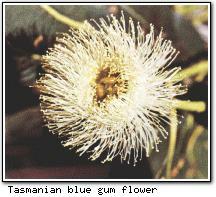 Tasmanian blue gums, or eucalypts, are the state floral symbol of Tasmania. The flower of a Tasmanian blue gum is shown on the right. Blue gums are one of 600 species of eucalypts in Australia and grow across the state in the drier, non-rainforest areas. Like most gums, the Tasmanian blue gum is fast-growing and strong with smooth bark, making it suitable for the rugged Australian landscape. They may grow over 225 feet in height (75 m). The foliage of the blue gum is a greyish blue, hence the name.